Flag Day in Poland has been celebrated annually on May 2 since 2004. Flag Day is considered a national holiday, but it is normally a working day unless it falls on a weekend. Polish Flag Day commemorates raising of the Polish flag on the Victory Column in the city of Berlin on May 2, 1945, at the end of the Battle of Berlin. The flag was hoisted by Polish Army troops who fought alongside their Soviet allies. 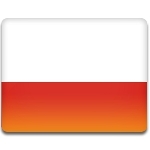 The national flag of Poland is a horizontal bicolor. The upper stripe is white and the lower stripe is read. These colors has been officially considered the national colors of Poland since 1831. Both of them were present on the coats of arms of Poland and Lithuania, two constituent nations of the Polish-Lithuanian Commonwealth. The flag of Poland was officially adopted in 1919. There is a variation of the flag that contains the national coat of arms in the middle of the upper stripe. It is used at sea and abroad. The naval ensign of Poland also has a swallow-tail. The national flag of Poland is flown continuously on the presidential palace and the parliament. State and local government organs are legally required to fly the flag on May 1 (May Day), May 2 (Flag Day), May 3 (Constitution Day) and November 11 (Independence Day).